Heavy rains and strong winds affected Havana Wednesday evening claiming two lives and inflicting property damage throughout the city. According to a report by the provincial Civil Defense Authority, 81-year-old Marta Damiana Acanda, drowned in the floods caused by the heavy rains, while Julio Eugenio Andino, 24, was electrocuted by fallen electric wires. 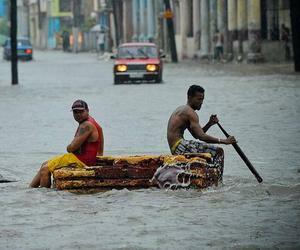 The information, which was published by Granma newspaper early hours on Thursday, explains that authorities reported 24 homes had partially collapsed and another three were totally destroyed, with the Havana municipalities of Centro Habana, Old Havana and Cerro being the most affected areas. Authorities activated evacuation centers west of the Capital city to protect the population that live in risky areas. However, the newspaper added that authorities are still assessing the material damage inflicted by the rains. Electric company brigades deployed in affected areas to clean the damage reestablish power supply following the passage of the thunderstorm.